On Jul. 9, 2018, Turkish President Tayyip Erdogan appointed then-chief of staff Gen. Hulusi Akar as the country’s new defense minister. A decade ago, the inclusion of a serving high-ranking officer in the cabinet would have been regarded as an extension of the shadow that the military once cast over Turkish politics. Today, it is seen rather as a sign of the extent to which Erdogan has eroded Turkey’s institutions and transformed the once virtually autonomous Turkish General Staff (TGS) into an instrument of his personal power. During the first years that the ruling Justice and Development Party, or AKP, was in power, Erdogan proceeded cautiously, convinced that he risked being ousted by a military coup. It was only in 2007, after then-chief of staff Gen. Yasar Buyukanit failed to follow through on his threat to stage a military takeover if the AKP appointed Islamist politician Abdullah Gul to the presidency that Erdogan finally realized what most of the generals had known for years—that the era of military tutelage was over. Confident that he no longer needed to fear the TGS, Erdogan supported the barrage of court cases—including the notorious Ergenekon and Sledgehammer investigations—instigated by his erstwhile allies in the Gulen movement that particularly targeted hard-line secularist elements in the officer corps. The cases had a devasting impact on officer morale, partly because it was common knowledge in the military that the allegations were fabrications, but mainly because the high command made little effort to prevent the accused officers from being charged and imprisoned, or to alleviate the sufferings endured by their families. Even when the system of military tutelage was at its height, the political influence wielded by the TGS had varied in both breadth and depth between policy areas. As the Gulenist-driven court cases continued, the extent of military influence began to contract and become increasingly confined to “hard security” areas, such as the war with the Kurdistan Workers’ Party (PKK). By 2015, the TGS was no longer able to project influence into non-military areas and had even yielded to Erdogan in areas that it had once regarded as its natural prerogative, such as decisions on defense procurement. But, although the court cases had targeted individual members of the officer corps—including former Chief of Staff General Ilker Basbug, who was imprisoned for two years during the Ergenekon investigations—Erdogan had made few attempts to interfere with the internal workings of the military as an institution. 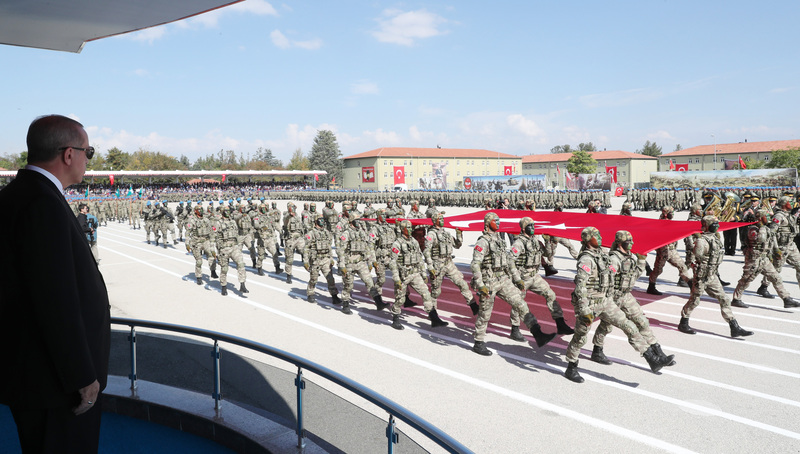 Even though it could no longer dictate to the civilian government, the military high command could still occasionally rebuff Erdogan when he tried to dictate to them—such as in June 2015 when the TGS refused to implement an order from Erdogan to launch a military incursion into Syria. This changed following the failed coup attempt of Jul. 15-16, 2016, as the last vestiges of the military’s ability to defy Erdogan dissolved. Two years later, the official narrative about what happened on the night of the attempted putsch still leaves many questions unanswered. What is clear is that, as he stated publicly on Jul. 17, 2016, Erdogan saw the coup as an opportunity not only to assert his personal control over the military but to try to reshape the officer corps in his own self-image. Whereas the TGS once projected its values outward onto the political sphere, it is now Erdogan who is projecting his values onto the TGS. The first sign of change came in August 2016 with the launch of Operation Euphrates Shield in northern Syria. Not only did the military make no attempt to block the operation, but Erdogan was able to choose its commander, Special Forces officer Lt. Gen. Zekai Aksakalli, who had been lauded in the pro-AKP media as one of the heroes of the resistance to the attempted putsch during the previous month. The result was a military shambles as Aksakalli found himself in charge of forces, such as armor and artillery, with which he had little experience. Erdogan also used the failed coup to initiate a radical reform of both the military’s structure and the methods by which new generations of officers are trained and indoctrinated. Previously, the military had effectively operated its own education system, starting with military high schools and continuing with military academies. In theory, the military high schools followed the national curriculum. In practice, the latter was adapted and supplemented to inculcate the tenets of Kemalism. Students who entered the academies after graduating from civilian high schools were vetted—not always successfully—in order to exclude those suspected of being hostile toward Kemalism. After the failed putsch of July 2016, the military high schools were abolished and responsibility for the administration of the military academies transferred from the TGS to the Ministry of National Education. In practice, this will lead to the institutional and the ideological integration of military personnel into the Turkish educational mainstream, where Erdogan has not only transformed the curriculum but has tried to tightly control how it is taught in order to instill future generations with his own conservative Sunni Muslim values. In addition, following the transition to an executive presidency on Jul. 9, 2018, it is Erdogan—rather than senior members of the military—who is now responsible for promotions to even relatively low ranks in the military, with an officer’s perceived loyalty to the president—rather than his competence—becoming the key to career advancement. The result is likely to be a further erosion of the Turkish military’s competence and operational capabilities. But, even though Erdogan has been fast-tracking his personal favorites through the military hierarchy, it will be at least 20 years before the cadets now starting their careers rise to senior positions. By that time Erdogan is likely to be long gone, leaving behind him a highly politicized officer corps rather than a meritocratic one.